Sunday November 19th 1893 Got around with the work to go to church. Uncle Jim Stevens & Ellen went with us and come back to dinner. They went over the river in the afternoon. We went first to Woolfs and then stopped at home on our way back. Went to church in the evening. weather pleasanter. Monday November 20th 1893 I washed alone this morning. Will went to the valley. It was a fine day. Had my work done so soon after one oclock I went over the river. Mother and I went out to see Mrs Dennis and came around to see Mollie Robinson. It was five oclock when I got home. I wrote to Charlie in the evening after getting my supper over. It is nine years today since Charlie & Ida were married. 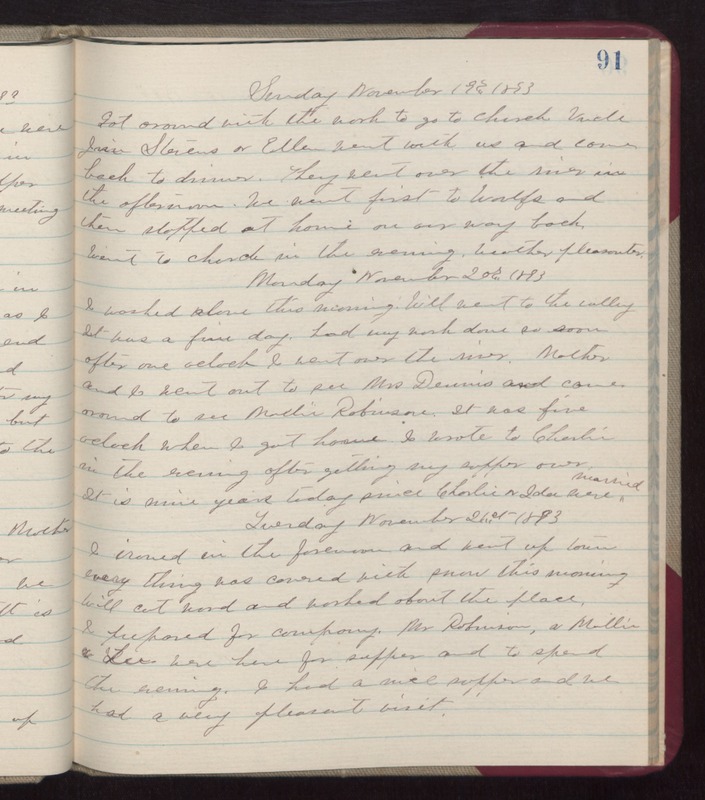 Tuesday November 21st 1893 I ironed in the forenoon and went up town every thing was covered with snow this morning. Will cut wood and worked about the place. I prepared for company Mr Robinson, & Mother & Lee were here for supper and to spend the morning. I had a nice supper and we had a very pleasant visit.